In August the constellation Scorpius rides across the southern horizon. This month, Saturn and Mars are in front of those distant stars. Antares is the brightest star of the group, rivaling the color and brightness of Mars. More about that next month. Besides the annual appearance of the Summer Milky Way and summer’s bright stars, the Perseid Meteors appear at mid-month. The meteoroids are bits of dust from Comet Swift-Tuttle. The debris continues to orbit the sun. During a few nights in mid-August, our planet intersects the orbital dust. These meteoroids collide with the atmosphere and they vaporize as they zip into the atmosphere at over 30 miles a second. From the ground we see a flash of light, a meteor or shooting star. Perseids can be seen anywhere in the sky as they seem to emerge from a spot in the constellation that rises in the northeast early in the evening and appears nearly overhead a sunrise. At their peak, observers may see one meteor a minute. 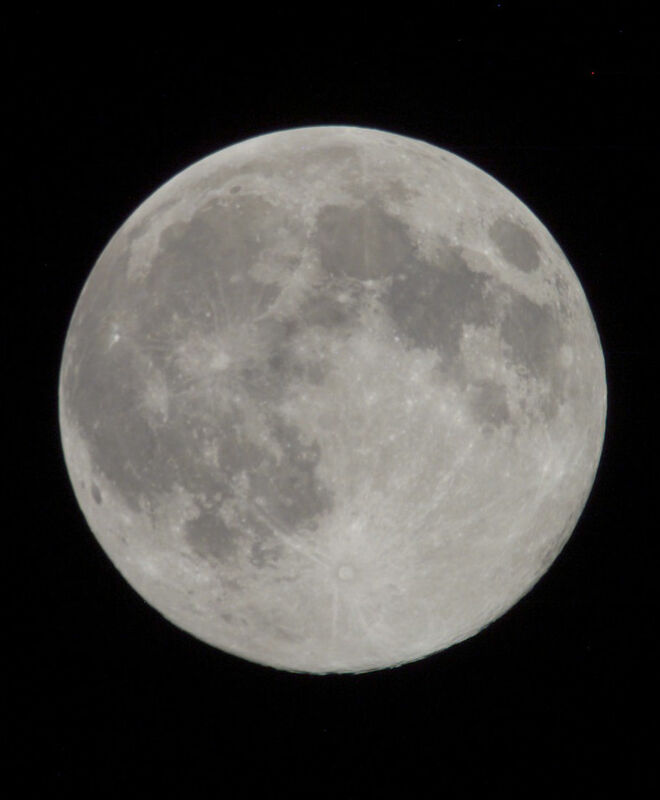 This year, the shower occurs at the time of the nearly full moon. The shower peaks at 7 p.m. on August 12, during daylight hours in North America. With the mornings of August 12 and August 13 illuminated by bright moonlight, only the brightest meteors are seen. The best view of the event is from a reclining chair or a blanket. First Quarter 08/03/14 (7:50 p.m.) 1:14 p.m. 11:55 p.m.
New Moon 08/25/14 (9:13 a.m.) 6:15 a.m. 7:25 p.m.
Mercury moves to the far side of the sun (superior conjunction) on August 8 and rapidly moves into the evening sky. From the northern hemisphere, it sets within an hour of sunset and largely lost in the sun’s brilliance. On the evening of August 27, the crescent moon appears near Mercury. Observers will need a good horizon and binoculars to find them. 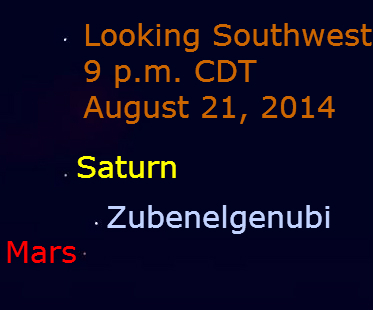 Mars and Saturn are easily seen in the southwest. August 2 — The moon is about 6 degrees to the upper left of the star Spica and 5 degrees to the right of Mars. Saturn is nearly 13 degrees to the upper left of Mars. 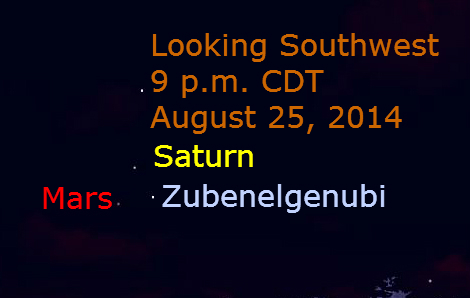 August 3 — Tonight, the moon appears Mars, Saturn and the star Zubenelgenubi. It is nearly 8 degrees from Mars and 5 degrees from Saturn. 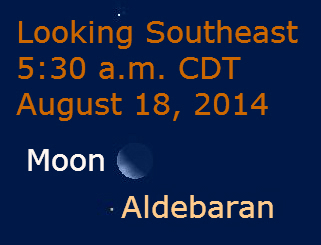 August 4 — The moon appears 8.5 degrees to Saturn’s upper left. August 5 — Tonight, the moon appears 7.5 degrees to the upper right of Antares, the brightest star in Scorpius. While they are far apart, notice the brightness and color of the star and the planet. Binoculars will help show the star colors. Mars continues its rapid eastward motion compared to the background stars. On August 21, Mars passes 1.5 degrees to the lower left of Zubenelgenubi. Saturn is nearly 4 degrees to the upper left of Mars. A few nights later, Mars passes Saturn. The two planets are separated by about 3.5 degrees. The moon appears with the planets late in the month. 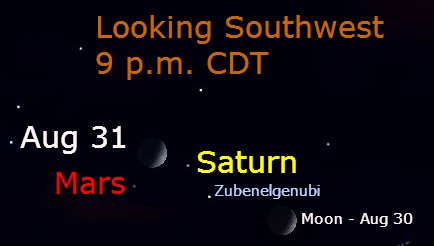 On August 30, the moon is about 9.5 degrees to the lower right of Saturn. On the next evening moon is 3 degrees to the left of Saturn and 3 degrees to the upper right of Mars. Venus continues to dominate the morning skies. During August , Venus rises closer to the sun. 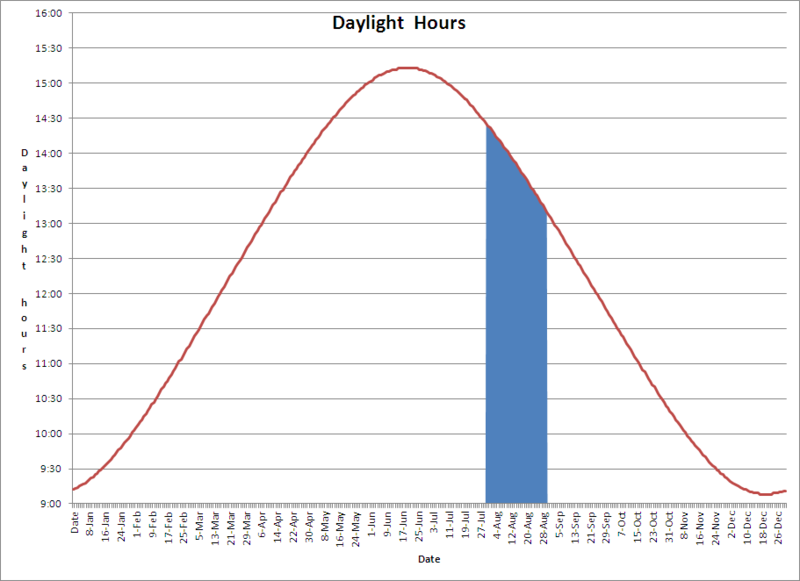 On August 1, it rises about 2 hours before the sun, but by month’s end, 75 minutes before the sun. It is moving toward superior conjunction in October and then moves into the morning sky. For more about Venus as a morning star, see our posting. The rising point of Venus along the eastern horizon continues to be north of sunrise. Early in the month, Venus rises about 6 degrees north of the sunrise point. By month’s end, the difference is 8 degrees. 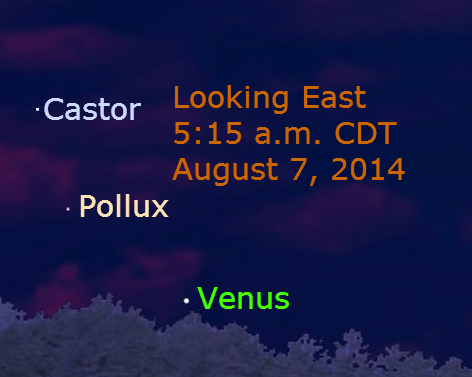 On August, Venus passes 7 degrees from Pollux. 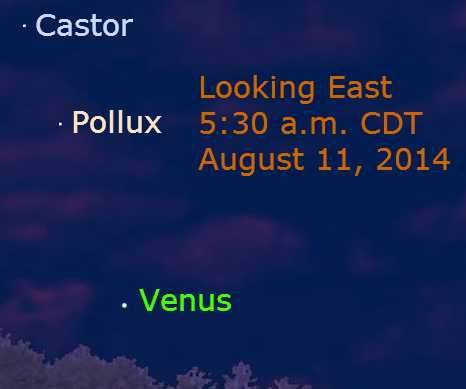 Its rapid orbital motion can be seen as it meets an imaginary line with Castor and Pollux on August 11. The month’s event is the close passing of Venus and Jupiter. 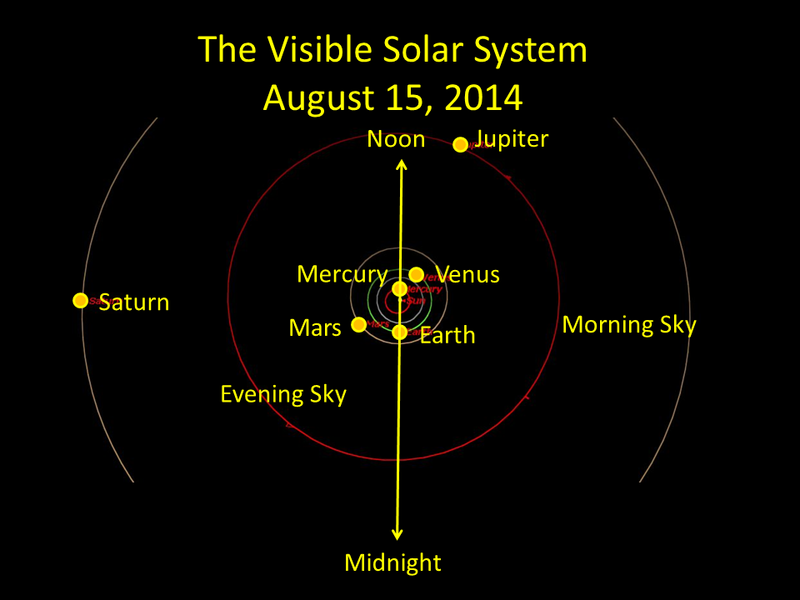 On the morning of August 18, the planets appear less than 1/3 degree apart. While appearing close together, they are millions of miles apart. So the solar system diagram below. On the preceding and following mornings, the pair is separated by about 1 degree. Unlike the slower moving Mars, Venus moves very rapidly against the background of stars, making many close groupings one day affairs. 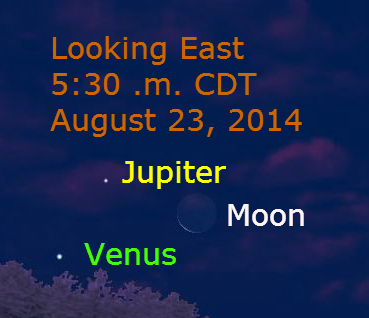 At the same time of the Venus-Jupiter conjunction, look higher in the sky for the moon. It is nearly 4 degrees from Aldebaran. 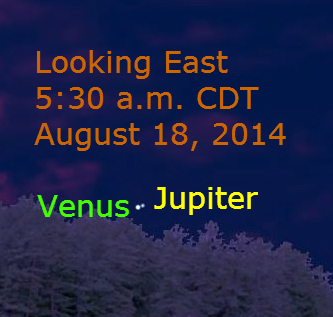 Venus continues its rapid eastward motion with the moon catching the planetary pair on the morning of August 23. On this morning they are over 5 degrees apart. The morning sky during August provides interesting planetary pairings as well as the lunar-muted Perseid meteor shower. 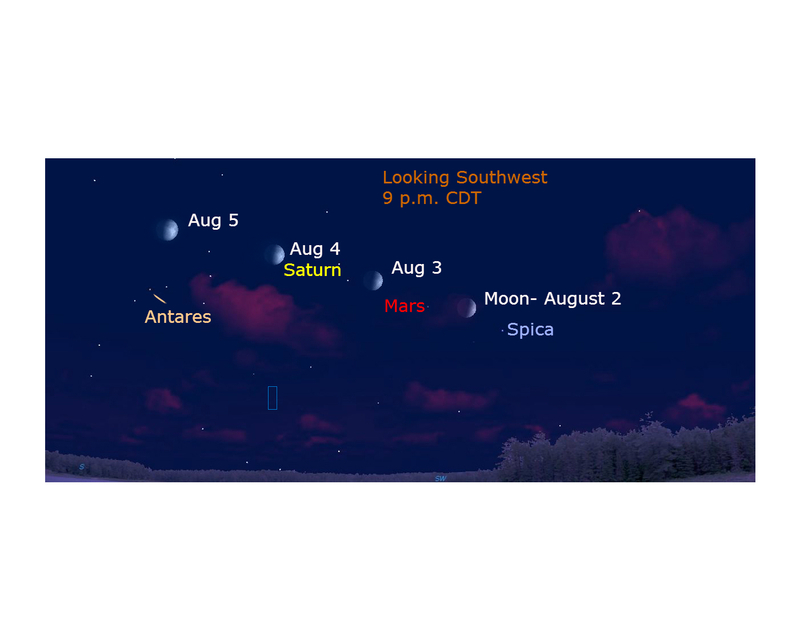 The chart above shows the planets visible without a telescope as seen from north of the solar system on August 15, 2014. (Click the image to see it larger.) Venus and Jupiter appear on the morning sky of our planet. Mars, Saturn, and Mercury are in the evening sky.